FILE - A health worker prepares insecticide before fumigating a neighborhood in San Juan, Puerto Rico, Jan. 27, 2016. U.S. health officials say that the more researchers learn about Zika, the more concerned they are about the neurological effects and long-term complications from the virus. "Everything we look at with this virus seems to be a bit scarier than we thought," Centers for Disease Control and Prevention Principal Deputy Director Dr. Anne Schuchat said. Schuchat joined National Institute of Allergy and Infectious Diseases Director (NIAID) Dr. Anthony Fauci at Monday's White House press briefing, outlining new findings that show Zika is linked to a broader set of pregnancy complications that go beyond the much-reported microcephaly. "[Studies show] It has a very strong propensity to destroy tissue, which could explain why besides interfering with the development of a fetus, it might directly attack brain tissue even when the fetus is later on in the period of gestation," Fauci said. Officials noted concern about the spread of the disease with "hundreds of thousands" of potential cases in Puerto Rico, while calling on Congress to approve a $1.9 billion emergency funding request to fight Zika. "If we don't get the money that the president has asked for, we are not going to be able to take it to the point where we actually accomplish what we need to do," Fauci said. "We really don't have what we need." FILE - Puerto Rico Health Department workers monitor social media for Zika related issues at the department's headquarters in San Juan, Puerto Rico. The NIAID director said health officials are doing what they can by transferring funds from other areas. Last week, the White House announced it would redirect $589 million in funds, the majority from existing Ebola resources, to fight the spread of the Zika virus. Officials are also urging Congress to replenish the redirected funds from the Ebola response. "We also feel a sense of urgency about Ebola and the global health security agenda. Ebola is still circulating in Liberia and Guinea, and many of the vulnerable countries in Africa are having outbreaks right now," Schuchat said. “We have to be, as a country, ready to support response to more than one outbreak at a time." White House officials have warned that without the funding, the U.S. risks the ability to properly respond to the Zika virus, including delays in mosquito control and surveillance, diagnostic testing and vaccine development. There are at least 672 confirmed cases of Zika in the United States, including 64 pregnant women. One Zika-related case of microcephaly has been confirmed in the state of Hawaii. Officials say local transmission is currently centered in Puerto Rico, the U.S. Virgin Islands and American Samoa. But they believe there will likely be local transmission in the continental United States in the coming months. "I don't expect there to be large outbreaks in the continental U.S.,” Schuchat told White House reporters Monday. “I can't give a number to how many cases, but I can say that we can't assume that we are not going to have a big problem." 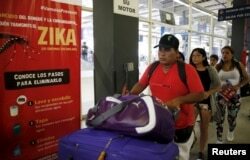 FILE - Travelers walk past a poster with information about the Zika virus during a campaign by Peru's Health Ministry at Plaza Norte bus station in Lima, Peru, Feb. 4, 2016. About 40 million people travel yearly between the continental U.S. and Zika-affected countries. The administration says that as of last week, 33 countries and territories in the Americas reported active Zika transmission. The administration's efforts are focused on Puerto Rico, with 31 personnel from the Centers for Disease Control on the ground and a dengue field office converted to handle the Zika response — including mosquito control and surveillance and the education of pregnant women. Some 5,000 kits have been distributed to pregnant women in areas where the virus is already spreading, Schuchat says. The kits include insect repellant, information on self-protection, condoms and vouchers for screening materials to keep mosquitoes outside the home.